Heart shaped peeps. 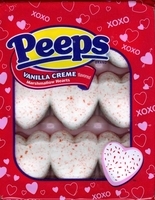 Soft marshmallow heart shaped peeps with a vanilla creme flavor. Each heart is white with red specks. A perfect Valentine candy to show your sweetheart you love them.